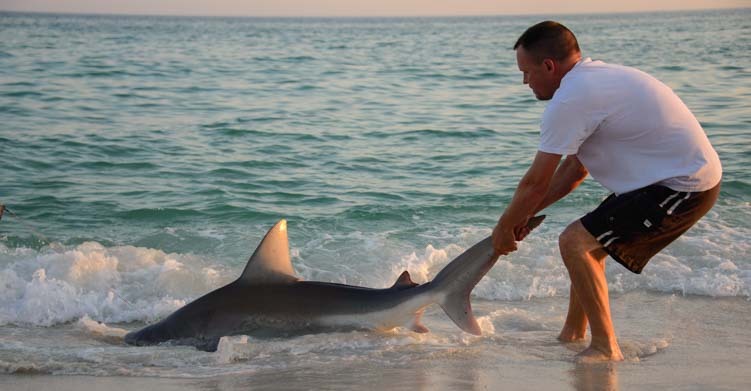 Sharks and Snakes on the Beach in Florida! We’ve been enjoying the Florida’s Emerald Coast (on the Gulf Coast in the panhandle) for the past few days. This coast got it’s name because of the brilliant green water that laps the shores of the exquisite white sand beaches. As each wave curls over, the crystal clear water shimmers in vivid shades of green. 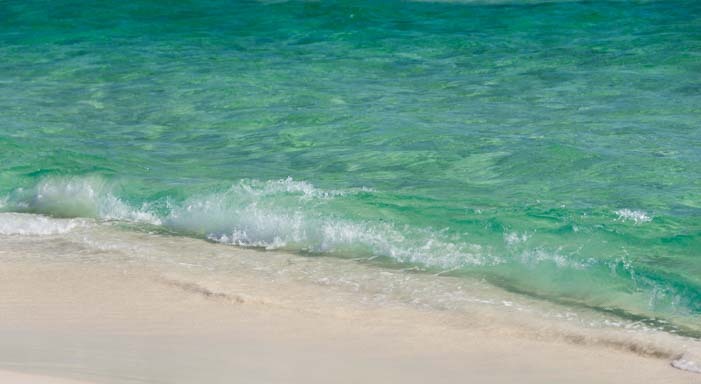 Glistening aquamarine waves on Florida’s Emerald Coast. I love beaches, and perhaps my favorite thing about them is that you never know what you’ll see when you go out for a stroll on the sand… We’ve seen little birds scampering along the edges of the waves, playing “catch me if you can” with the endless rollers. We’ve seen happy beach-goers sunning themselves on beach towels and relaxing under colorful umbrellas. A nice spot to sit for a spell…! But these images are all to be expected when you go to the beach. 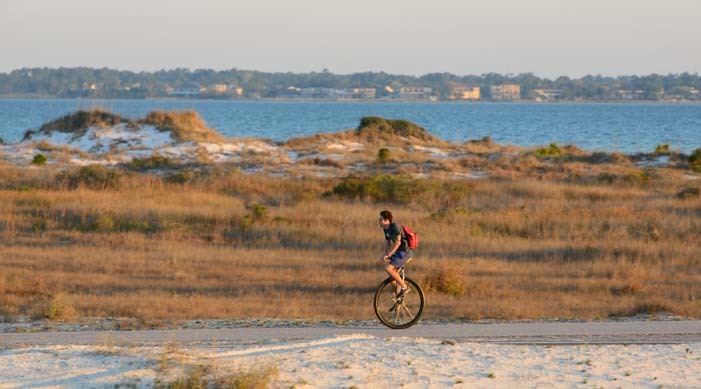 What a surprise it was to look up at one point and see a guy barelling down the road next to the beach on a unicycle! What a great way to commute! Beautiful girls in bikinis walking the beach are not a surprise to see, especially during Spring Break. But our eyes bugged out when two girls approached us with something strange looped around their necks. Is that what I think it is?? Wait, can I see that a little closer? Holy Cow!! I didn’t know what to say when they told me they were taking their snakes for a walk. He stuck his tongue out at me! The lighter colored snake was an albino red tail boa constrictor that was just seven months old and would one day be 12 feet long (yikes!). The darker one was a python that was already full grown. Good heavenly days!! Another day when we went down to the beach for sunset shots we saw a guy out fishing. 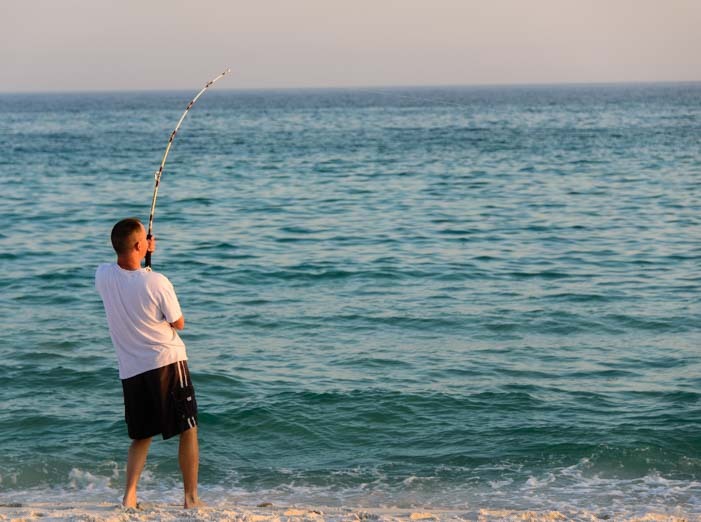 A fisherman tries his luck on the shore. He seemed to have something on the line. And it seemed pretty big! But what could be that big? “A manta ray,” was the rumor I heard from his friends who were watching. They had all seen a huge manta ray earlier in the day. Wow… it looks like he’s got something! Ummm… is that what I think it is?? The fisherman struggled to reel it in! That fish does NOT want to end up on the beach. Then he finally managed to bring it onto the beach. 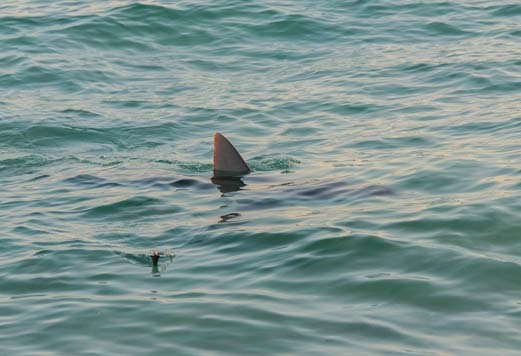 Got him — and no doubt, this is a SHARK!! Getting the hook out of his mouth was a challenge. 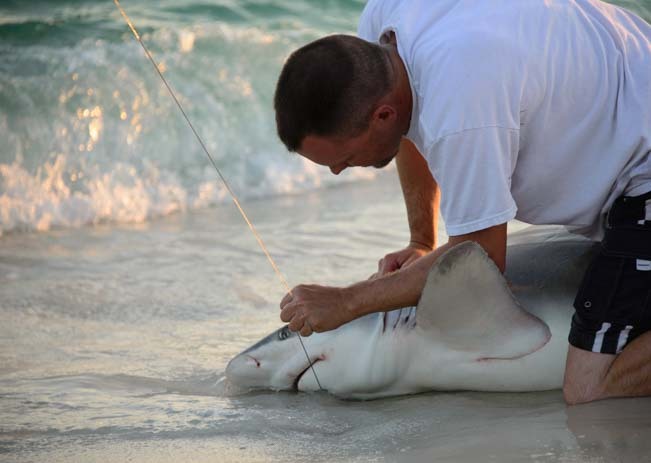 But then he finally got the hook out and turned the shark to face out towards the open ocean. 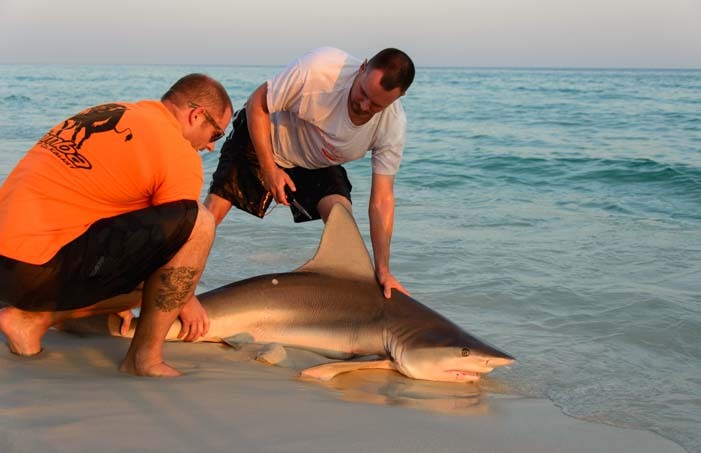 He didn’t have a tape measure, but he estimated the shark was a little over 7 feet long. Good grief! Mark had been swimming out there just a few hours earlier!! He’s aimed towards the open ocean and set free again. 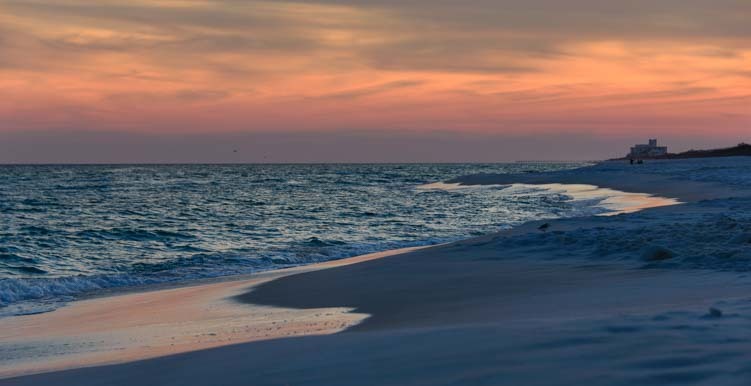 And then the sun began to set with beautiful peach colored skies reflecting in the wet sand — another lovely sighting here on the Gulf Coast of Florida. This entry was posted in Quick Pics and tagged Florida, Quick Pics by Roads Less Traveled. Bookmark the permalink. 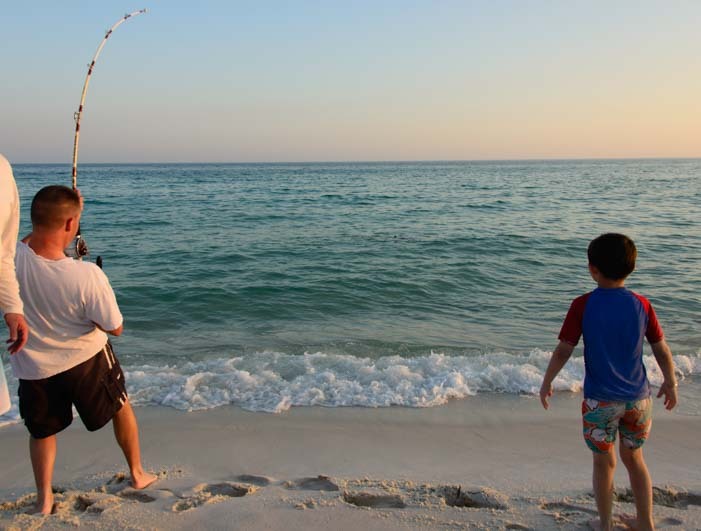 What a beautiful stretch of beach and OMG all the excitement – the shark catch would have freaked me out too if my hunny had been out there swimming earlier! Are you installing solar power on your RV roof? Some tilting brackets (left) and some lap sealant (right) may come in handy! Learn more about RV solar power at: Solar power for RVs and Boats. No one likes the RV dump, but two products we use every time are an ezyme & bacteria based holding tank treatment (left) and disposable rubber gloves (right)! Find more tips for dumping the tanks in our RV Dump Tips page.